Awhile back I had mentioned poutine. Oh tasty of tasties. I am Canadian so it really was only a matter of time before I had to give in to my poutine need. Most folks feel this has to always be such an unhealthy dish, I guess if we have to be purist about it yes it is unhealthy. 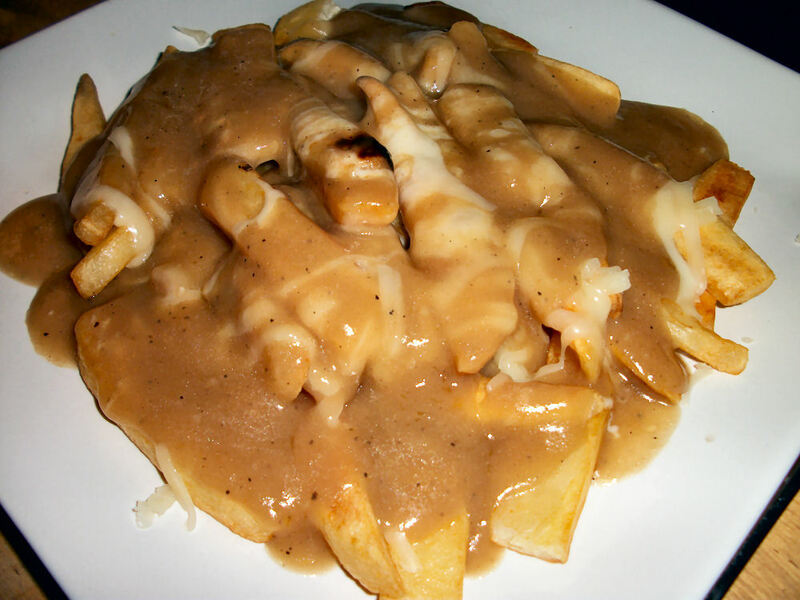 For folks not in the know poutine is a dish of fries, covered with cheese curds, then slathered with delicious gravy. Oh yes. It came to us from Quebec…and it was good (heavenly sounds from above). *cough* anyways! In my travels across this great land of ours I have come across many variations of poutine: Sloppy joe poutine (sloppy joe sauce on cheese and fries), stuffed poutine (stuffing, cheese, fries, and gravy. It’s gooooood), chicken poutine (bits of friend chicken, cheese, gravy, fries), montreal smoked meat poutine (deli cuts, blah, blah, blah). Just to name a few, you get the idea though. Now, I was thinking, there has to be a way to indulge in poutine but still stay on track…and lo…there is. With so much variation available with poutine we just have to change up our basic ingredients slightly. Tada! Poutine was had, it was great…omnomnomnom. Soak the potatoes in a salt water solution for 15 minutes. Remove and pat dry with a papertowel. Spray baking pan, arrange potatoes in a single layer, spray potatoes with baking spray. Season to taste. Bake for 20 minutes, flip then bake for another 10 minutes. Transfer the fries to two separate plates. Cover each plate with 1/2 cup of cheese each then top with 1/2 cup of gravy each. Microwave for 30 seconds and serve! Makes two large servings. Each serving contains 471 calories, 6.7 grams of fat and 7.7 grams of fibre if you used the cottage cheese. If you used the skim mozz then it contains 525 calories, 13.3 grams of fat and 9.4 grams of fibre. It is definitely much better nutrition wise with the cottage cheese but if you are like my husband and the idea of cottage cheese sguigs you out then atleast there is another option. It all melts to happy goodness goo and worth the small indulgence. You can break this into smaller portions and have it as a side dish as well. This entry was posted in Comfort Foods, Dinner, Sidedish and tagged Cheese, Potato. Bookmark the permalink.